Stocks look set to recover from two straight days of losses Friday as investors digest another swath of corporate earnings. U.S. stock futures were higher, a day after losses in technology and financial shares sent U.S. stocks lower Thursday. A big week for corporate earnings concludes Friday with results due before the opening bell from a trio of big firms. McDonald's (MCD) reported higher quarterly revenues and profit, but a decline in same-store sales. Shares fell 2% in premarket trading. Honeywell (HON) reported an increase in first quarter earnings, pushing up its stock price by 1%. General Electric (GE) reported better-than-expected earnings and revenue, though the conglomerate ended the quarter with a big backlog of equipment and services. Shares fell more than 2%. A trio of tech heavyweights reported after the bell Thursday. IBM (IBM) reported first-quarter results that fell short of estimates, prompting its stock to drop 4% . 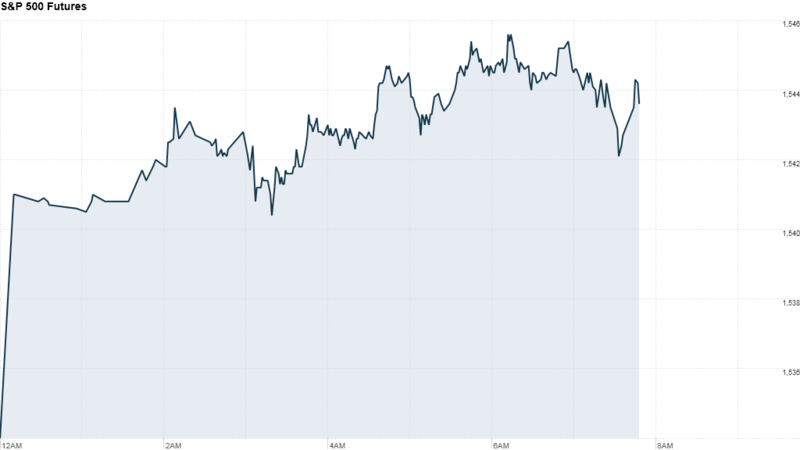 Microsoft (MSFT) got a big boost in its latest earnings report from strong Windows 8 sales, pushing up its stock 2%. Google (GOOG) earnings topped estimates, even as the search giant faces challenges with how to make money off mobile ads and its Motorola smartphone unit. The company's stock rose nearly 2% in premarket trading. Chipolte's (CMG) share price rose 5% after reporting earnings on Thursday that showed increases in revenue, income and same-store sales. Dell's (DELL) stock fell more than 2% following reports that Blackstone (BX) dropped its bid to buy the computer company. Analysts expect earnings for S&P 500 companies to rise by 1.85%, according to S&P Capital IQ. So far, 91 S&P 500 companies have reported, with 64 beating forecasts, 19 missing and 8 coming in in line. European markets moved higher in morning trading, led by the CAC 40 in Paris with a gain of 1.4%, while Asian markets also ended firmer. The Shanghai Composite closed up 2.1%, Hong Kong's Hang Seng up 2.3% and Japan's Nikkei up 0.7%.